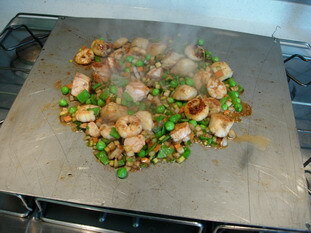 The plancha is a cooking method that originated in Spain. 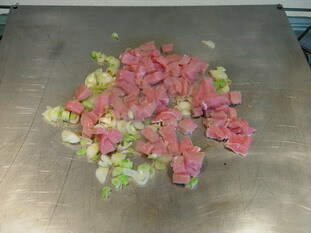 It consists of a very hot metal plate on which food, usually cut in small pieces, is cooked with little fat. 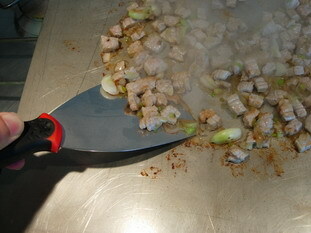 Contact with the hot plate means that cooking is very rapid, only a few minutes, and there is an obvious "cooked" side. Food is well browned but not in direct contact with the flame as on a barbecue. The plancha transforms whatever it cooks, grilled prawns, for example, are already very good, but with lemon juice and a dash of olive oil, the grilled/fried taste is intensified, and becomes simply extraordinary! Many kinds of plancha are available now, in shops that sell barbecues, in every style and at every price. But if you do not want to invest in a plancha, or at any rate not right now, here are some hints to help you make your own quite cheaply. Making a plancha is like cooking with it, quite simple. You need to find a stainless steel plate of "food" quality and fairly thick. Choose the size according to your the size of your cooker and the number of burners. Mine is about 35 X 40 cm (13 X 16 inches) and 1.5 mm (0.05") thick. 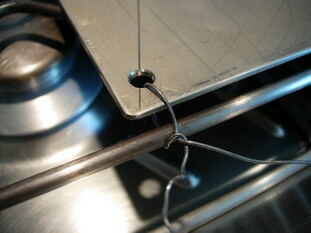 To fix it over the hob burners, I drilled a hole in each corner, and in each hole I put a short length of iron wire. This is just to prevent the plancha from moving while in use. 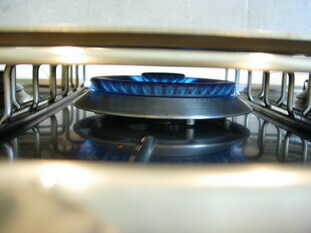 Ideally the plancha should be centred on the biggest burner, because it needs plenty of heat. That's all there is to it, your plancha is ready for use. Utensils can be inexpensive too: buy a stainless steel painter's knife or scraper from a DIY store, large enough to handle food easily (mine is 10 cm / 4 inches wide). It's best to get two, which makes moving food around on the plancha very easy. Get another one the same, or a stainless pie or fish slice. 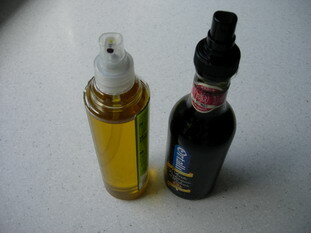 Another worthwhile tool is a spray, which allows you to add a small amount of something but very evenly. I suggest you usue one for oil, and maybe another for vinegar, balsamic for example (the one you see in photo is a present from my old friend Robert). 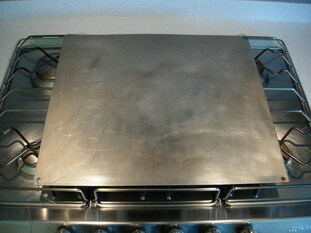 The basic rule is that the plancha must be very hot when food is put on to cook. This heating time might take a few minutes because it should reach 490°F (250°C). To see if this temperature has been reached, put a few drops of water on the plancha. The drops should separate into smaller drops in all directions. ...and adding the food to cook. 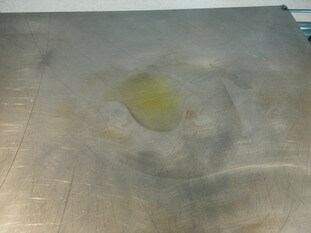 Or spray the food directly with oil and then put on the plancha. I find this second way more efficient. As soon as one side of food is cooked (1 or 2 minutes usually), turn over using the knife or slice. Try adding any aromatic ingredients you have: salt, pepper, herbs, spices, sauces, etc. You will see on plancha everything is good! Cook on all sides to your taste, then divide between serving plates. I am looking for a large (48"?) 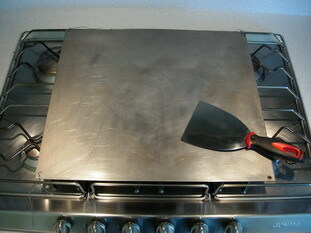 natural gas plancha griddle, any suggestions? This kind of plancha is quite common in trade, but you will have to choose between stainless steel and enameled cast iron. 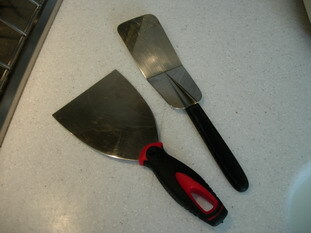 I personally prefer the first one, stronger and more resistant to scratch with iron tools like large spatula. Looking to put an outdoor plancha over an outdoor fire pit at the folks house. Any advice, options or ideas would be helpful. Thanks!